Every time I think I know what the days dental appointment will consist of, I end up being way off. I guess I could just ask what the will be done during the next appointment when I leave the last one but that would be too easy. So today I had appointment #2 of Trip #2. I again decided to take advantage of the beautiful weather and walk to the clinic. More on that later. I thought today would just consist of going over the shape and size of my upcoming permanent teeth. But wrong again. I was in the chair for another 2 hours and this is what was done...straight from the Dr. Prada, "We made a verification jig to confirm the accurate implant impressions. We also made a more accurate bite registration". Now what does that mean you ask? It meant 2 more hours in the chair and that's all I know. 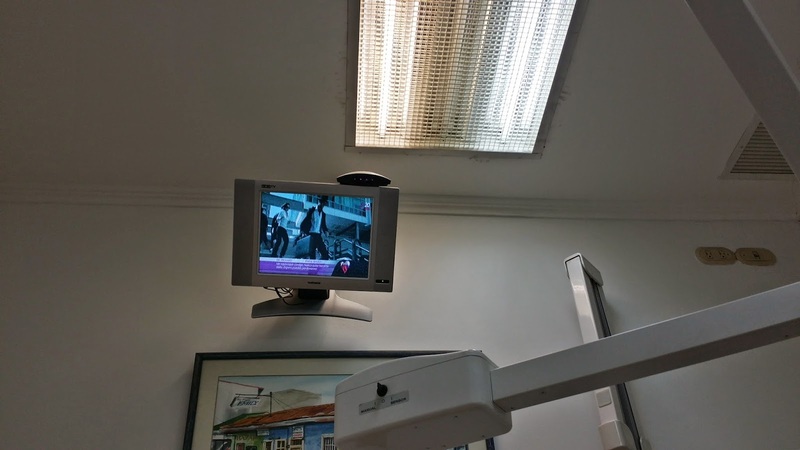 They numbed me, they worked on me and all the while I had headphones on and tapping my fingers along to local music videos on the overhead TV. Yes I took that photo while they were working on me. Hey a blogger has to do what a blogger has to do. Anyhow after it was all done and they had replaced my temporary bridge, I was informed that I will see Dr. Gonzalez, the one who placed the implants among other procedures, at 1400 hrs tomorrow. That's 2pm for you rookies.